#23A: The steadily growing human population, and especially the demands that their activities have placed on the Earth's natural cycles in the last two centuries, increasingly threaten the planet's biosphere. Two hundred years ago that population topped one billion—today it is 6.7 billion. The 19th century brought the scientific and technological understanding to really put the energy stored in fossil fuels (coal, oil, natural gas, etc.) to work in meeting human needs. Combustion of fossil fuel, and the amount of the carbon dioxide (CO2) gas given off in this process, steadily grew throughout the 20th century. During the first decade of the 21st century, human activity was putting around 50,000 million metric tons of CO2 (or its equivalent) into the atmosphere every year. Atmospheric CO2 plays a key role in the planet's carbon cycle—specifically in the naturally occurring greenhouse effect (see Figure #23a), where it helps to trap radiant energy the Earth would otherwise lose to space. 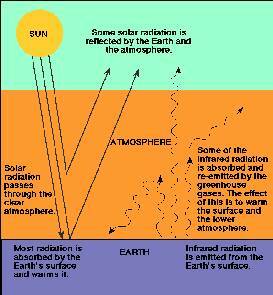 Human activity adding so much CO2 to the atmosphere (see Figure #23b) is enhancing the greenhouse effect. The result is that more heat is trapped and the planet is warming up—something the UN's Intergovern- mental Panel on Climate Change (IPCC) concluded in early 2007 is a 90% to 95% certainty. While less than one degree Celsius of warming has already occurred, the IPCC cites computer models projecting future warming of between 1.1 to 6.4 degrees in the next century. Significant global climate change might be expected disrupting natural ecosystems, human society, and human comfort. How serious is the problem? Some feel that a six degree rise could "eliminate most life on Earth, including much of humanity." People can keep disruption to a minimum by using fossil fuel energy more efficiently and increasingly switching from it to renewable energy. because people burned all that coal they mistakenly thought was "cheap!" Like those who respect "Environmental Economics" (theme #40), those valuing "Sustainability" would also like to see the market system put prices on things (like pollution, ecosystem services, etc.) that reflect true environmental costs. While gen- erally supporting the goals of Greens and the Environmental movement (recycling, reducing one's carbon footprint, preserving wilderness, etc.) they differ among themselves over their commitment to "Enoughness." #23B: "Small is beautiful" is often linked with a philosophy popularized in the early 1970s by E.F. Schumacher, who was inspired by Gandhi. It is a philosophy of enoughness. It appreciates both human needs & limitations, and appropriate technology—technology with little or no significant environmental impact that is well suited to an area since it makes use of what is relatively abundant. Blasting notions that "growth is good" and "bigger is better," Schumacher felt that "the aim ought to be to obtain the maximum amount of well being with the minimum amount of consumption." He helped inspire a voluntary simplicity movement, based on simple, ecologically grounded, non-consumerist lifestyles that people voluntarily choose—typically for environmental, spiritual, or ethical reasons. Those in the last category may strive to use no more than their fair "ecoshare." For others, practicing enoughness begins with a thrifty orientation and involves lots of creatively "making do."